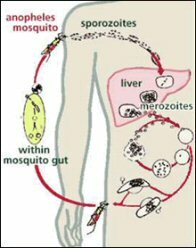 These parasites enter the host's bloodstream when bitten by an infected mosquito and then migrate to the liver where they multiply before returning back into the bloodstream to invade the red blood cells. 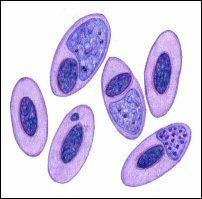 The parasites continue to multiply inside the red cells until they burst releasing large numbers of free parasites into the blood plasma causing the characteristic fever associated with the disease. This phase of the disease occurs in cycles of approximately 48 hours. The World Health Organisation estimates that each year 300-500 million cases of malaria occur worldwide and more than two million people die of malaria. Between 1990 - 2009, every year approximately 1,800 British travellers return home with malaria. The UK is one of the biggest importers of malaria into Europe. Click on the image (right) to view a video presentation showing the dangers of Malaria, how easily it can spread, and it's effects on humans. The world's first malaria vaccine, has received a green light for future use in babies in sub-Saharan Africa. The European Medicines Agency gave the Mosquirix vaccine a favorable review after 30 years of research by the Malaria Vaccine Initiative. The drug will now be examined by the World Health Organization. 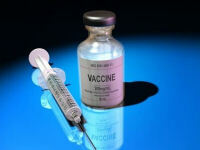 Individual countries will also need to give the vaccine their final approval before it can be administered to children. Mosquirix is aimed at young children because their immune system is still developing. There is currently no vaccine available to travellers. Unlike other vaccines that tackle viruses and bacteria, Mosquirix has been designed to prevent illness caused by a parasite. 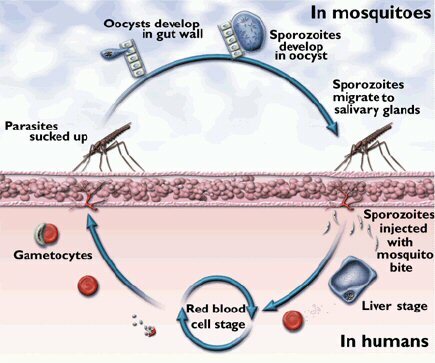 It works by stopping the malaria parasite maturing and multiplying in the liver, after which it would normally enter the patient's bloodstream and trigger the disease symptoms. The vaccine is not yet licensed in countries where malaria is endemic, and the WHO says 2017 is the soonest that could happen. It should be noted that no prophylactic regimen is 100% effective and advice on malaria prophylaxis changes frequently. 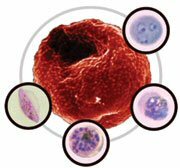 There are currently five prophylactic regimens used (A,B,C,D & E), due to the differing resistance that exists by the malaria parasites to the various drugs used. 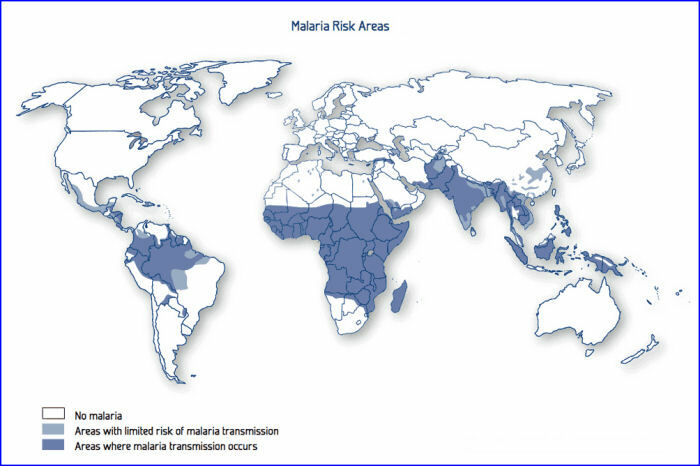 (See the above map of Malaria Endemic Areas). Doxycycline does carry some risk of photosensitisation i.e. can make you prone to sunburn. 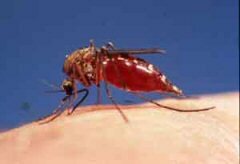 It is the plasmodia that cause malaria that develop resistance to anti-malarial drugs not the mosquitoes that transmit the disease. 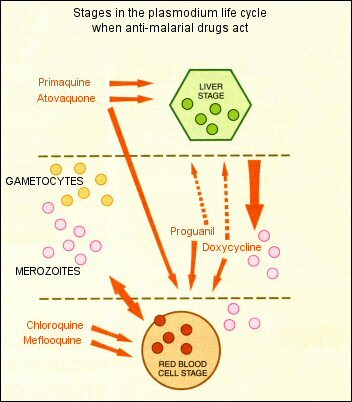 The discovery of chloroquine revolutionalised the treatment of malaria, pushing quinine to the sidelines. 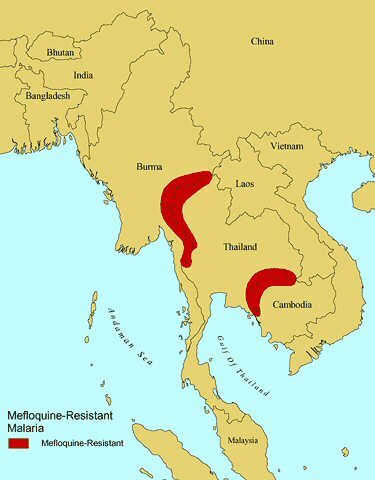 Resistance to chloroquine began from two epi-centres; Colombia (South America) and Thailand (South East Asia) in the early 1960s. Since then, resistance has been spreading world wide. malaria prevention for trips of 1 week to 1 year to all countries. 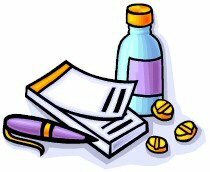 Medicine from NHS pharmacy - UK regulated. Cape Verde - Remember, low risk if fever develops. Mauritius - Except a few rural areas where chloroquine prophylaxis is appropriate. Risk in parts of the country Some chloroquine resistance present. Botswana - Only in the northern half of the country - November to June. Mauritania - All year round in the south. November to June in the north. Zimbabwe - Areas below 1,200 metres - November to June. All year long in the Zambezi Valley where Doxycycline, Mefloquine or Malarone are preferable. Risk is negligible in Harare and Bulawayo. Risk very high, or locally very high. Chloroquine resistance very widespread. Namibia - The northern third of the country - November to June. All year long around the Kavango and Kunene rivers. South Africa - North east, low altitude areas of Mpumalanga and Northern Provinces, Northeast KwaZulu-Natal as far south as the Tugela river. Risk present in Kruger National Park. Zimbabwe - The Zambezi Valley. Egypt - Main tourist areas are malaria free. Georgia - Some south eastern villages July to October. Kyrgystan - Some southern and western areas. Morocco - A few rural areas only limited risk. Turkey - Most tourist areas. Uzbekistan - Sporadic cases in extreme south east only. Armenia - The whole country June to October. Azerbaijan - Southern border area June to October. Egypt - El Faiyum region only, June to October. Iraq - Basrah and rural north, May to November. Syria - Northern border, May to October. Turkey The plain around Adana, Side & south east Anatolia, March to November. Turkmenistan - The south east only, June to October. Risk present. Some chloroquine resistance present. Afghanistan - Areas below 2,000 metres, May to November. Oman - Remote rural areas only. Saudi Arabia - The whole country except northern, eastern and central provinces, Asir plateau, and western border cities where there is very little risk. No risk in Mecca. Tajikistan - Southern border areas, June to October. Yemen - No risk in Sana'a city. India - No risk in parts of mountain states of the north. Risk variable. Chloroquine resistance usually moderate. Bangladesh - The whole country except Chittagong Hill Tracts. No risk in Dhaka City. Bhutan - Southern districts only. India - All areas below 2,000 metres, including Goa. Nepal - Areas below 1,500 metres, especially Terai districts. No risk in Kathmandu. Pakistan - Areas below 2,000 metres. Sri Lanka - No risk in Colombo. Bangladesh - Chittagong Hill Tract Districts only. Risk very low. Remember malaria is possible if fever develops. China - Main tourist areas. Indonesia - Jakarta, main cites and tourist resorts including Java. Malaysia - Most areas including Kuala Lumpur and Penang. North Korea - A few southern areas have limited risk. Philippines - Low risk in main cities, Cebu, Bohol & Catanduanes. No risk in Manilla. South Korea - Limited risk in the extreme northwest. Sarawak - (Borneo) except deep forest areas. Thailand - Bangkok and main tourist areas including Pattaya, Phuket, Krabi, Hua Hin, Koh Samui, Kanchanaburi, Damnoen Sadouak, Ayutthaya, Sukhothai, Khon Kaen & Chiang Mai. Risk variable. Some chloroquine resistance. Indonesia - Areas other than Bali and low risk cities, or Irian Jaya and Lombok where the risk is high and chloroquine resistance is present. Philippines - Rural areas below 600 metres. Malaysia and Sarawak (Borneo) - Deep forest regions of penninsular Malaysia and Sarawak. Cambodia - Most of the country except Phnom Penh where there is no risk. China - Yunnan and Hainan provences only. All other remote areas use chloroquine. Laos - except Vientiane where there is no risk. Vietnam - Most rural areas, no risk in cities, Red River delta area and the coastal plain north of Nha Trang. Thailand - Near borders with Cambodia & Myanmar. Koh Chang. Myanmar - Eastern part of Shan state. Papua New Guinea - below 1,800 metres. Brazil - Except the Amazon basin region, Mato Grosso & Maranhao. Risk variable to low, no chloroquine resistance present. Argentina - Rural areas along northern borders only. Belize - Rural areas except Belize district. Costa Rica - Rural areas below 500m. El Salvador - Only Santa Ana province in the West. Guatamala - Areas below 1,500 metres. Haiti - The whole country. Honduras - The whole country. Mexico - Some rural areas rarely stayed in by tourists. Nicaragua - The whole country. Panama - West of the canal. Paraguay - Some rural areas. Risk variable or high, some chloroquine resistance present. 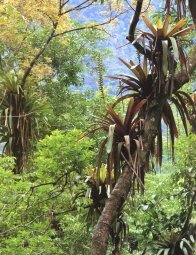 Ecuador - Areas below 1,500 metres. No malaria in Galapagos Islands nor in Guayaquil. Panama - East of the canal. Peru - Rural areas below 1,500 metres. Venezuela - Rural areas other than the coast. Caracas is free of malaria. Brazil - Amazon basin region, Mato Grosso & Maranhao only. Very low risk and no chemoprophylazis required elsewhere. French Guiana - Especially border areas. Guyana - All interior regions. Surinam - Except Paramaribo and coast.